• The set deadline of the 2nd phase of the admission process is approved by the Ministry of Higher Education. • Applicants should pay for the application form and submit the original documents required for admission before Tuesday, 18th September. Any application forms or other additional documents received after the aforementioned deadline shall NOT be accepted. • According to the regulations set by the ministry of Higher Education, applicants of ONLY the highest grades shall be accepted. • Results of the equivalent and foreign certificates shall be announced by the end of the 2nd phase of the admission process as set by the ministry of Higher Education. 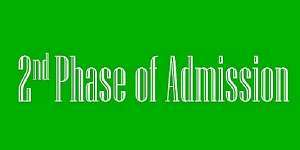 • Applicants should achieve the minimum grades for admission before paying a 500 L.E. non-refundable application form. Applicants should be noted that buying an application form is NOT considered a final registration at the university.